Whew! I can't believe it's Monday already! 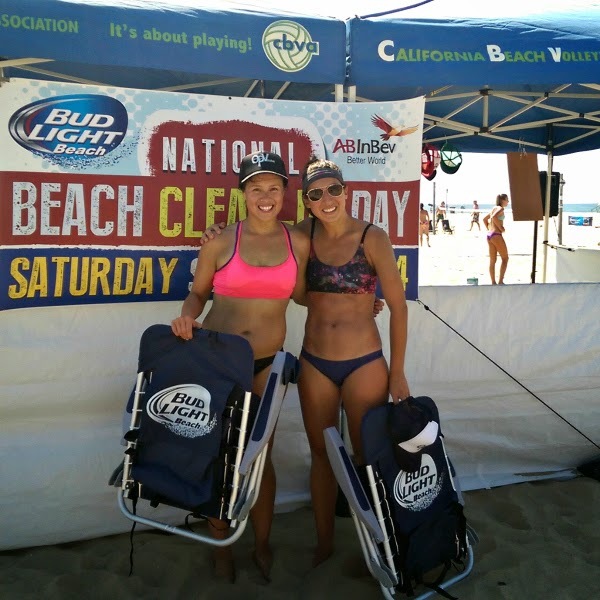 I had a super active weekend, with a beach volleyball tournament on Saturday and my first 10K on Sunday. I was pretty nervous about playing a whole day of volleyball the day before my race, but it was totally worth it because we won! After getting back from LA, resting, and re-hydrating as much as possible Saturday night, I was up bright and early again for the She.is.beautiful 10K on Sunday. 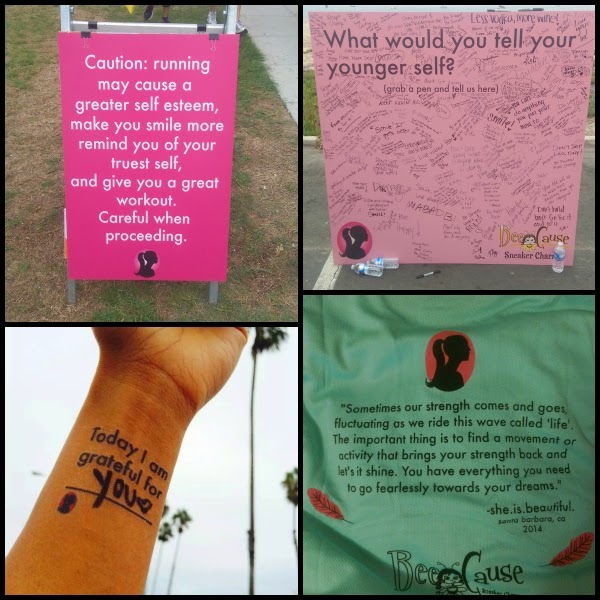 She.is.beautiful is an all women's race which focuses on encouraging self love, confidence, and empowerment for all levels of runners and walkers. 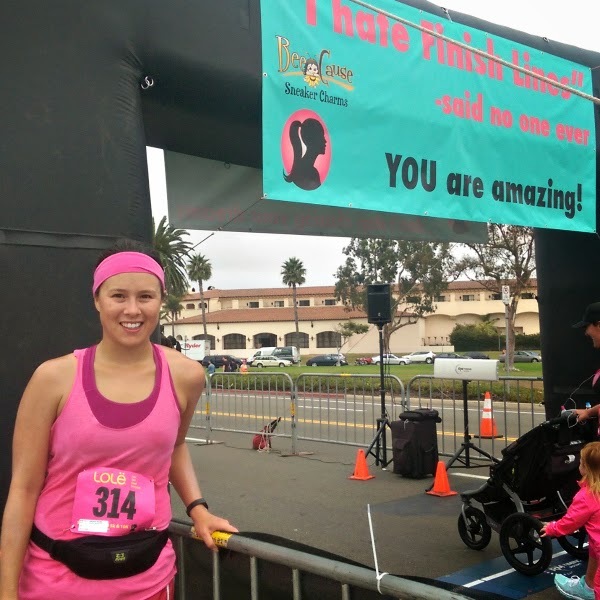 The whole positive focus of the race was really cool, as was the fact that race proceeds went to benefit Girls Inc., an awesome nonprofit whose mission is to inspire all girls to be strong, smart and bold. There were conveniently two days of pre-race packet pick up so I was able to get my bib on Friday before I left for my tournament in LA. I was running the race with 7 of my awesome co-workers and friends, and we all met at the office and carpooled down to the race. Parking was a little tight by 7:15, but we were able to find a spot that wasn't too far away. Race-day packet pickup and registration lines looked fairly short and organized, and there were plenty of port-a-potties. We headed to the start line about 20 minutes before the 8:00 AM start. My legs were feeling pretty dead from Saturday's tournament, plus I rolled my ankle AFTER the tournament when I stepped in a hole running into the ocean (typical me). I was figuring I'd be lucky to run under 11 minute miles and might have to walk a lot. So I left my speedier coworkers and headed back to the 9-12 minute mile marker. Unfortunately, the 9-12 minute mile section was by far the most popular and the most crowded. With the 5K and 10K starting at the same time and over 1400 runners in both races, it took me a few minutes to even weave my way in to the corral. While the crowding was a little crazy, the energy was super positive and I loved seeing the sea of pink. The race organizers led what looked like a pretty fun workout at about 8:55, but I was a little too pinned in to move much. Then, right around 8:00 AM we were off! Since everything was so crowded, I was stuck at a walk at first, then a slow jog until things cleared out after a quarter of a mile or so. I'm not gonna lie, my legs felt pretty terrible and I was doing my best to take it slowly, so I was pretty surprised when my phone kept telling me my split pace was under 10 minutes. I was worried I would burn out but figured I'd just go with it. The course was similar to the Chardonnay 10-Miler, so there were lots of pretty beach views to distract me from my tired legs and all the runners were really supportive and encouraging. The race organizers also did a great job of getting out volunteers to cheer everyone on, and even had male-only-staffed water stations. It was great to see a group of men supporting a group of women at an athletic event, and the gender role reversal felt pretty empowering. The whole day was also filled with inspirational messages, including motivational quote signs all down the race course. It sounds cheesy, but they really inspired me. I haven't been feeling the best about my body image since I gained a bunch of weight after my cross-country move, so a lot of the messages resonated with me and even had me a little teary eyed. All the signs telling me that I was beautiful, strong, powerful, and enough just as I am really hit home and helped me keep going. After the turnaround point, I realized I still wasn't losing my pace and starting finding people to stay with. I lost some speed on a crazy steep hill during mile 5, but my phone kept telling me that I was running 9:30 splits. I figured I had started it too early or the GPS was off and it was probably wrong. It took me a while to stop MyFitnessPal on my phone, so I wasn't sure what my chip time would be. Luckily, SVE Timing emailed out the results really soon so we had them by the time we sat down to our post-race breakfast. And my chip time was 57:54! That's a 9:20 minute mile!! Ok so that's still over 20 minutes slower than the 1st place finisher (36:48! How is that even possible?!) but for a tired and painful leg day where I thought I'd be lucky to run 10 minute miles, I'm pretty proud of myself. I even ran negative splits on every mile after mile 2, except for a slight slow down on terrible-hill-filled mile 5. Plus I also finished 176 out of over 700 runners and 37th out of the 150+ runners in my 25-29 age group. Really makes me want to run another 10K that I actually train and am rested for to see how fast I can go! This was my favorite race ever! 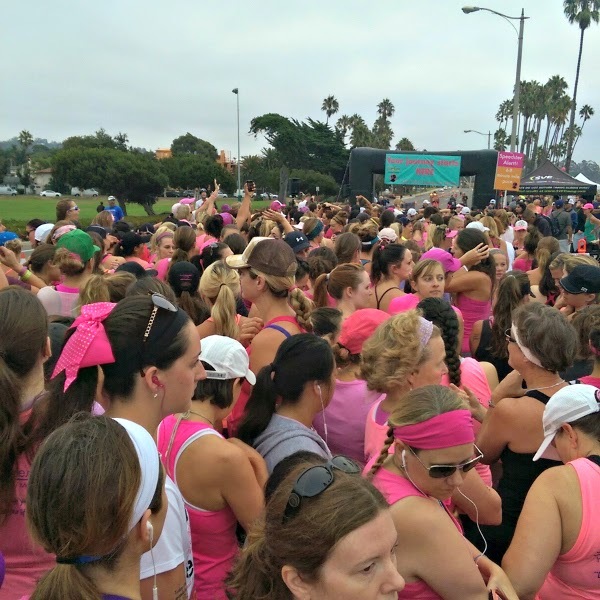 The race day energy, positive messages, crowd and runner support, fun pink outfits, and whole vibe made for an awesome experience. Plus, being able to run with my strong and inspiring female coworkers made the day even more special. 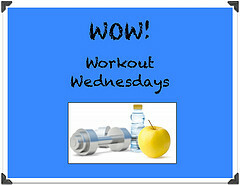 I loved seeing so many women all on their own fitness journeys and ROCKING IT! 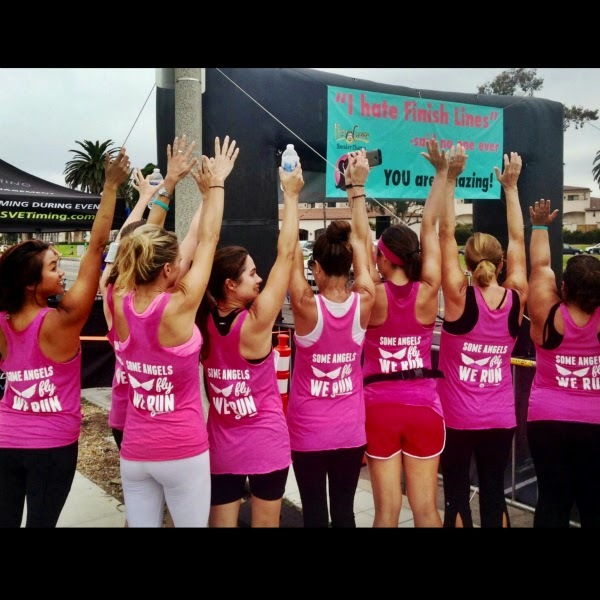 I would ABSOLUTELY recommend this race next year to any ladies near Santa Barbara. It would also make a great run-cation, and any out of town visitors can totally come hang out with me. I'm even considering driving up to Santa Cruz for the She.is.beautiful race in March! Q: What was your favorite race ever? Have you ever seen so much pink in your life? Wow, great job on the race! And it sounds like such a fun event with the beach views and positive messages. Thanks so much Chaitali! It was the best experience, I definitely highly recommend it if you're ever looking for a California run-cation! That's awesome!! Especially with a bum ankle! 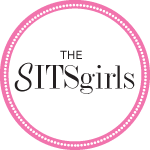 Sounds like a great event, I really enjoy the all women's events, they are very empowering! Congratulations on both the win and the race! That's fantastic! My favorite race was the NYC marathon, not the feeling, because well it was painful at the end, but the energy and crowd were just phenomenal! 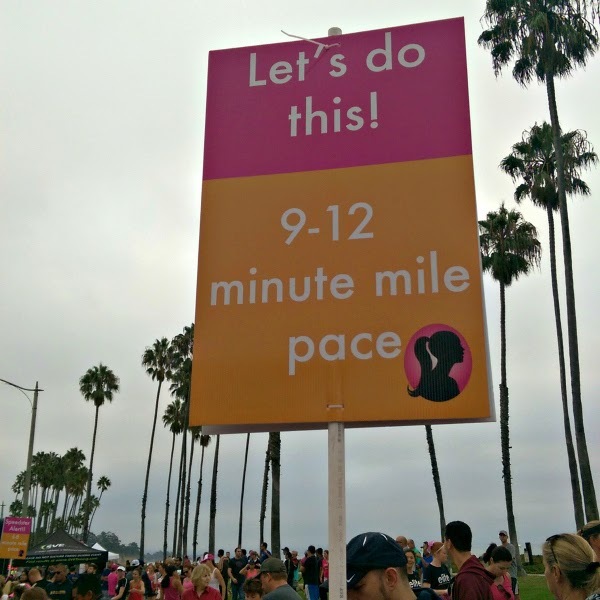 It sounds like an incredible race and a wonderful cause! Wow! that is a lot pink! and you a had a FAB weekend! I ran a 5K and then did my first aerial yoga class- good weekend for all! Thanks Mary Beth! Ooh aerial yoga sounds amazing! I hope you post a recap on your blog, would love to read your thoughts! Congrats on the win AND having an amazing race!! You are speedy :) What a great cause to run for. Thanks Jenny! It was definitely speedy for me but I was in the middle of pack for my coworkers. Some of them are super fast! Makes me want to do more speed work, until it comes time to actually get out and do the speed work that is lol. Congrats Amanda, you killed it! I'm still dreaming of doing a 10K...still on my bucket list! Looks like you had a great time! Thanks Janelle! I highly recommend it. Definitely my favorite distance so far!